Brush length: 17.2cm. Special Heart Shape Design and Fashion Pink Color. Ultra luxe, ultra plush tool for perfect airbrush application. Provides the capability to build coverage with foundation or powder and buff away imperfections. This brush was designed with leading plastic surgeons to apply BOTH foundation and concealer to a flawless, airbrushed finish! It CC Color Correcting Full Coverage Cream # Light 1.08 us fl.0z new unsealed without box has little scratches. 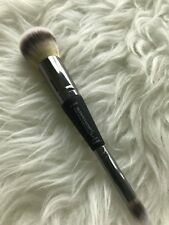 CC Skin Perfecting Brush. Does not affect this product. This is for anyone who wants an even application and the look of airbrushed perfection from the simple swipe of a brush! 100% Synthetic and expertly shaped, the Heavenly Luxe™ Plush Paddle Foundation Brush is designed to evenly apply and blend cream and liquid foundation on your skin to an airbrushed finish! Universal Brow Pencil. Color is UNIVERSAL TAUPE. New in Box. Elastic Stretch Volumizing Mascara. Lash-Changing Power Brush for maximum reach, lift, separation and curl. Not Waterproof. Use within 6 months of opening. Pointed Precision Complexion. Heavenly Luxe. An award winning pressed powder formulated with silk, peptides and hydrolyzed collagen to blur the look of pores, creating an airbrushed complexion. Can also be used as a blotting powder. It Brushes Air Brush OMG! It is ideal for erasing the look enlarged pores and fine lines and wrinkles. Phthalate Free. AIRBRUSH SCULPTING & HIGHLIGHTING 2-PIECE BRUSH SET. - Airbrush Contour Brush: using your contour brush, apply bronzer and dark shades of foundation and concealer to visually minimize the areas where the sun naturally hits your face, such as under your cheekbones, top of your forehead and the sides of your nose. Lot code shown in pictures. IT COSMETICS CC Cream Illumination Shade Medium Tan 1.08 OZ. Brand New In Box. Condition is New. Shipped with USPS First Class Package. Minimize the appearance of blemishes and combat shine in just one step with Bye Bye Breakout Powder, your airbrushed complexion perfection in a jar! Bye Bye Breakout. Blemish-Minimizing Weightless Finishing Veil. Shade ~ Midnight Navy ~. Liner Love. This Item has minor scratches on cap. Does not affect this product. IT COSMETICS Superhero Elastic Stretch Volumizing Mascara .3oz FULL Size in Box! Developed with plastic surgeons, Superhero™ mascara is like skin care for your lashes. Lashes are lifted and separated to create a fuller lash line and to ensure that no lash is left behind. The super-buildable formula takes your lashes to new heights. Use w/ liquid or cream foundation. Brush Flat topped luxuriously dense. Unique star shape reaches every corner of your face! Airbrush Foundation: Fluffy, rounded brush great for applying foundation. Airbrush Concealer: Fluffy, rounded brush head. Airbrush Crease: Narrow, tapered head designed to fit into the crease of the eye area. 1 LOOSE BRUSH, NO SEAL BECAUSE IT"S PULLED FROM A QVC SET! NOT affiliated w/ QVC. Heavenly Luxe. "NO-TUG CREASE EYE SHADOW BRUSH". A deluxe, travel-sized brush with ultra-plush Heavenly Luxe synthetic hairs. Ideal for flawless application of the CC Cream. OMBRE RADIANCE BRONZER. WARM RADIANCE. NEW W / O BOX ! Smudge Brush. IT Brushes for ULTA Make a Night of IT! Crease Brush. Foundation Brush. Blush Brush. Eyeshadow Brush. Full-size foundation, blush, eyeshadow, smudger and crease brushes do the work for you to effortlessly apply your favorite face and eye makeup formulas. Shade ~ Joyful ~. Vitality Lip Flush.